Bluetooth Mesh is a new standard from Bluetooth SIG that was released in 2017. It enables many-to-many device communication (as opposed to point-to-point approach in BLE) and is optimised for large-scale networks like building automation or sensors network. It utilizes managed flood based approach where only mains-powered nodes relay messages making it very power efficient (battery powered low-power nodes that don’t relay messages can operate in mesh network for years). Bluetooth Mesh is complementary to Bluetooth specification and requires features from 4.0 release only. This allows deployment of networks using hardware already available on the market. Proxy - receive and retransmit mesh messages between GATT and advertising bearers. Provisioning is a process of adding an unprovisioned device to a mesh network managed by a Provisioner. A Provisioner provides the unprovisioned device with provisioning data that allows it to become a mesh node (network key, current IV index and unicast address). A Provisioner is typically a smart phone or other mobile computing device. Complex models e.g. Lighting may contain other models eg Generic On/Off. 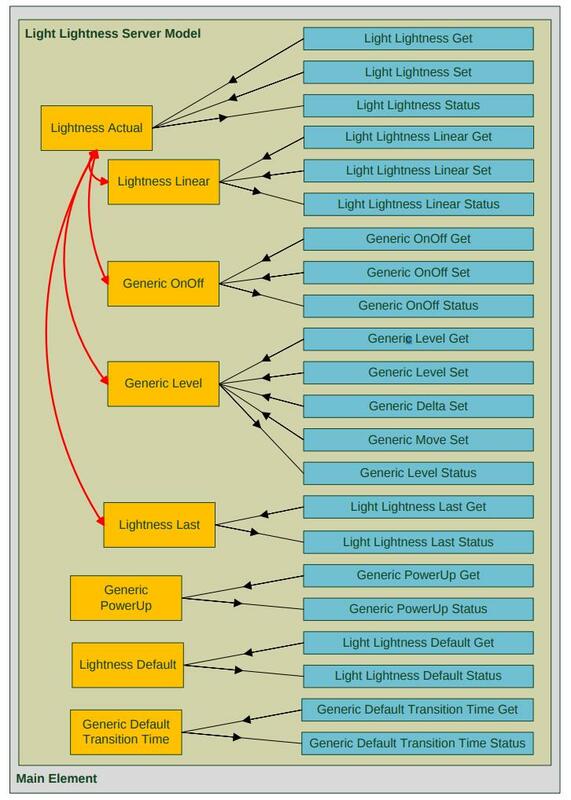 The following image shows an example of Light Lightness Server Model.